Goa is India smallest state by area and the fourth smallest by population. Panaji is the state's capital, while Vasco da Gama is the largest city. Goa, is split into two districts - North Goa and South Goa. North Goa includes the capital city of Panjim, the former capital of Old Goa, Fort Aguada and Candolim, Chapora, Vagator, and the beaches Calangute, Anjuna, and Baga. South Goa includes Vasco da Gama, Bogmalo, Margao, Colva and Benolem. The beaches such as Dona Paula, Calangute, Anjuna, Colva, Miramar, and Vagator can be compared with the best beaches around the world. Goa is popular for its beaches, places of worship and world heritage architecture, Goa is visited by large numbers of international and domestic tourists each year. Depending on your budget, you can choose to explore Goa in various ways. Hire a cab to take you around the city. Motorcycles can be hired to explore the city or you can choose to ride along as a pillion on a motorcycle taxi. Buses also connect various cities within Goa. Autorickshaws are another option to travel within the city. Tourist season is from October to December and from May to June. 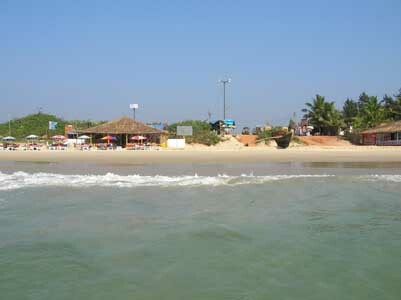 *About Goa location: Goa is located on the western coast of the Indian peninsula. It is separated from Maharashtra in the north, Karnataka in the south, the Western Ghats in the east, and the Arabian Sea in the west by the Terekhol River. *Capital of Goa: Panaji or Panjim is the capital of Goa. *Liberation Day of Goa: December 17. *Statehood Day of Goa: May 30. *Languages of Goa: Along with English which is widely spoken all over Goa, Konkani and Marathi are the state languages. The national language Hindi is also well understood in most areas around the state. *Area of Goa: 3,702 square kms. *Official Language of Goa: Konkani. Goa is known for its virgin beaches, Gothic churches, whitewashed chapels, crumbling forts.Palm-fringed beaches, coconut groves, ferry rides, and bubbly folk music are some of the things that make Goa the paradise for tourists. Yes, Goa is one of the outstanding places in India. Every year numbers of travelers visit from the corner of the Globe. There are lots of beaches, resorts and some of the best romantic places over there. The best time to visit Goa in between October and March when temperature and moisture more manageable. I have been to Goa and its truly beautiful place. I am sure your post on Goa Information will be helpful to all who is looking for Goa tour. Go us the land of wild rave parties and long lazy afternoon siestas. A land also of endless stretches of soft sand, nut-brown friendly people and excited busy bazaars. Swaying palms, white sands and sparkling waters: the three essential elements that attract 2 million visitors annually to Goa. A must visited place is Goa in India. Thanks for sharing detail information about Goa. Looking for more travel information on Goa. Goa has a moderate temperature showing negligible variations in different seasons. May is the hottest month while January and February are the coldest. There is a prevalence of tropical weather rest of the year. Southwest Monsoon brings rain in Goa between June and September. July is the month that receives maximum rainfall while February gets least amount of rain. Goa attracts thousands of beach lovers and regular tourists from far and wide. The beaches here in Goa are beautiful. You must make Goa tour to see its beauty.